Apple Is 'Extremely Sorry' For Its Much-Maligned Maps, CEO Tim Cook Says : The Two-Way Faced with a "public relations disaster," the company is even suggesting that while it works out the bugs customers can use Google Maps instead. Will it take you where you want to go? A new iPhone 5 and Apple's new mapping software. 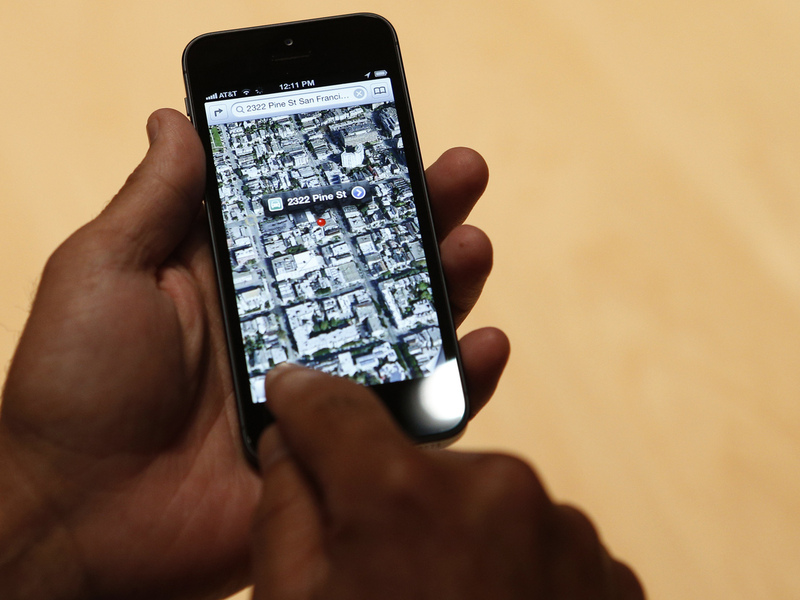 How much of a "public relations disaster" has Apple's new mapping software been? Big enough that the famously proud company has apologized — and suggested that users can turn to arch rival Google Maps instead. "While we're improving Maps, you can try alternatives by downloading map apps from the App Store like Bing, MapQuest and Waze, or use Google or Nokia maps by going to their websites and creating an icon on your home screen to their web app." NPR's Steve Henn (who we're quoting when we call this maps mess-up a "public relations disaster") talked on Morning Edition earlier this week about some of the mistakes users have been finding in Apple's maps. "The maps misplaced the Huey P. Long Bridge in New Orleans, they erased Stratford-upon-Avon from the British countryside, and in aerial views of Las Vegas, it appears as if the city may be melting," he said. And in Palo Alto — the late Apple co-founder Steve Jobs' home town — gadget tracker Carolina Milenesi said Apple Maps led her to a dead end instead of her destination. Now, as NBC News' GadgetBox blog writes, "one can only imagine how much it pains Cook to suggest that the over 100 million folks who are using iOS 6 at this time should just try a product made by Apple's competitors for a while." And one can only wonder at how Jobs might have handled the situation. Back in July 2010 at the height of "antennagate" (when users were complaining that their iPhone 4s were dropping calls), Jobs conceded that Apple wasn't perfect. But he was quick to add that "every smartphone has this issue." Apple's stock has been down a bit this morning. It was off about 1.3 percent at 10:30 a.m. ET.